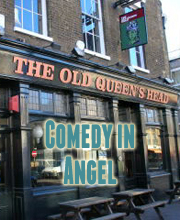 Laugh Out London comedy club brings you some of the best value alternative comedy nights in London in Angel, Tooting and King's Cross. Previous acts include Daniel Kitson, Stewart Lee, Simon Munnery, Mark Thomas, Brendon Burns, Josh Widdicombe, Josie Long, Andy Zaltzman, Isy Suttie, Sara Pascoe, Doctor Brown, Pappy's, Bridget Christie, James Acaster, Andy Parsons and loads more. Laugh Out London may be taking a break until 2017 (when we are back with our exciting annual Hootenanny!) but don’t worry, there is still plenty of Christmas comedy fun going on until the end of the year. We’ve already seen some amazing festive-themed shows this year, including My Big fat Weirdos Christmas Wedding at Leicester Square Theatre and John Kearns’ run at Battersea Arts Centre, and are looking forward to this lovely lot in London. Edinburgh Fringe Best Show nominee and all round brilliant stand-up Liam Williams has teamed up with fellow member of sketch group Sheeps Daran Johnson to write an original panto all about the travails of moving to London as a young person and being hit by disenfranchisement, political disillusionment, economic instability and alienation. Liam has always been an insightful and perceptive stand-up, analysing modern middle-class life in astute and hilarious detail, and we can only expect that same level of wit is prevalent through this present-day fairy-tale. There’s an amazing cost of comedic talent too, including Fresh Meat’s Charlotte Ritchie and regular acts on the circuit such as David Elms and Ellie White. We saw again this year how much Josie Long is growing as a performer, with a smart and passionate Fringe show that asked serious questions about the impact of Brexit and also gave a ray of hope to those who have felt a bit battered by events of 2016. She’ll be in full festive mood for this show, where she discusses the dilemma of hosting your own Christmas. One of the buzz shows at this year’s Edinburgh Fringe, it was not a surprise when Jayde Adams picked up a Best Newcomer nomination at the Comedy Awards. She’s now taken that show to Soho Theatre over Christmas to tell a London audience about how she found the confidence to be herself after 31 years of trying to be other people. Expect some disco dancing. A vital member of celebrated improve group Austentatious, Joseph Morpurgo is also one of the best character comedians going, with his 2015 Edinburgh Fringe show Soothing Sounds For The Baby ranking among our favourites of all time. He’s doing a free, one-off work-in-progress at the lovely new Bill Murray pub that will undoubtedly be the first steps to another masterpiece of character comedy. Also at the Bill Murray is another hero of the alternative comedy scene John-Luke Roberts who brings back his monster alter ego to prevent what he describes as the “perfect late advent hootenanny of bizarre comedy and small tentacles”. I’m in.